After we got back from Hawaii, it took us a week or so to get adjusted back to Eastern time. The first few nights, the kids were up until after 10. I think the 2nd night back, they didn't go to sleep until after midnight! We had a low key July 4th around Atlanta. It rained, actually. I opted to not run the Peachtree this year. Looking back I wish I would have because it would have been my 10th. The Saturday after July 4th, the kids and I headed up to Pennsylvania to spend a week with my parents. The first night we were there, Charlotte got to stay up really late and have her first try at catching lightening bugs. I'm not sure how many she caught, but she had a lot of fun trying. Since we didn't get to see any fireworks on the 4th, we stayed up SUPER late to see the fireworks that the racetrack near my parents would fire. After a quick run through their neighborhood (when we realized they were starting and we couldn't see them), we had great found great seats on bleachers at a nearby baseball field. We had a wonderful summer night. The next day we visited my parent's church (where the kids dutifully, without tears, went to the nursery). After church, my dad had the idea to go to the lake at Mt. Gretna. We had a great time there that afternoon. 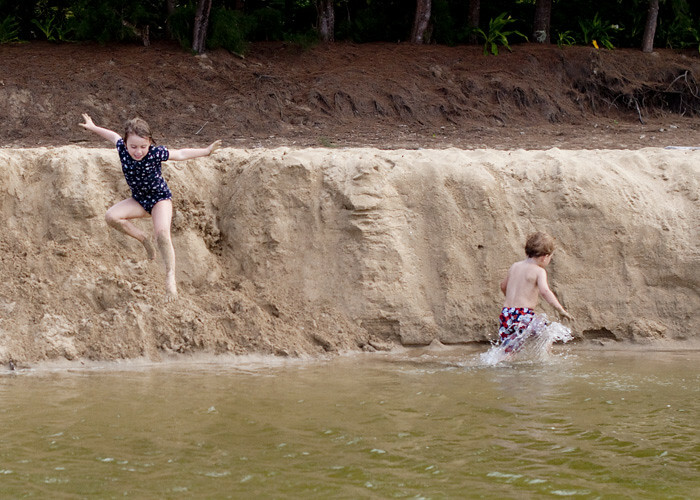 We swam, jumped off of docks, splashed, and played in the sand. My mom watched the kids in the morning during the rest of the week while I worked. Then, we would usually do some sort of activity in the afternoon. Even though the forecast wasn't great, we decided to head to Hershey Park on the Wednesday that we were there. It rained in the morning, and then towards lunch time it started to look really dark. We thought about not going, but that day was really the only chance we had left. So, we went for it - and we are SO happy we did. It poured as we drove over to Hershey. It was pouring when we parked the car. It was 2 o'clock, we waited in the car for 10 minutes and it started to lighten up. So, we decided to go ahead and go into the park. We saw lots of REALLY wet people leaving as we were going in. Luckily for us, we didn't get rained on again. Everyone cleared out of the park, and we walked onto every ride we wanted to ride without waiting in any lines. Max wasn't too sure about the rides at first, but then got really into it. Charlotte could hardly handle it. She wanted to ride anything and everything. She rode every roller coaster she was tall enough to ride. We ended up staying almost 6 hours! We spent one afternoon with my Grandmother outside of Philadelphia. My sister and nephew, Jacob, came to visit us on Friday. We had a really nice day hanging out with them. We played at the park, played with toys, hung out and had a great time! Sadly, the week had come to an end on Saturday and we had to board a plane home. Happily, though, we got to fly home and see Judd who celebrated his birthday that same day. We made him a root beer cake, drew pictures for him, and sung him a Happy Birthday. At the end of July, I was lucky enough to head to Nashville to spend a weekend with some of my closest friends. We have known each other since freshman year of college and we still have a great time with each other. We did the usual - pedicures, eating out, and shopping. We also went to see the Grand 'Ol Opry, which was very fun. That weekend went by way to fast. After that trip, my time was focused on getting Charlotte ready for her first big day of school. 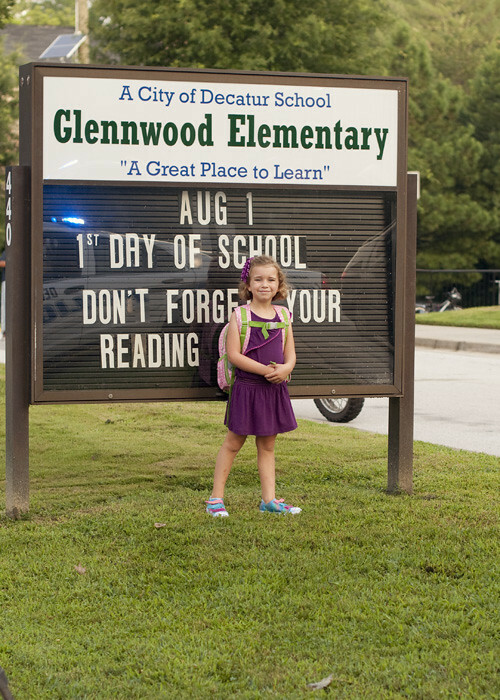 Summer was getting ready to come to an end for our little kindergartner. This summer was pretty darn awesome. Since I actually have a job now that requires me to be at a computer each morning, I hired in some help this summer. Our lovely and talented cousin, Mariel dutifully watched my children each morning. They played, took walks, went to the park, crafted, and baked. In the afternoons, the kids and I would hit the pool, run errands, or hang out. We spent every morning of the first week of June at VBS. We had a great time learning about God and how he can work in our lives. We sang songs, danced, and played. Charlotte said the closing prayer in front of 300 kids and adults on the first day! It was a great week. The rest of the month of June was spent thinking about and being in Hawaii! 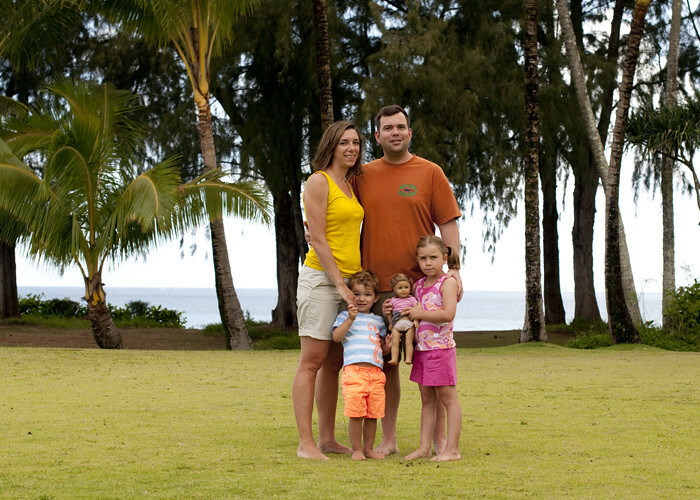 We left on June 15th for a 10 day adventure on the island of Kauai. We had our first flight to LA, spent 2 hours in LA, and then flew to Lihue. The kids did WAY better than we anticipated on the flights. By the time we got to our rental house, it was 3AM our time. We stayed right in the middle of Hanalei bay. We had the bottom story of a two story house. The backyard was the bay. It was amazing to say the least. The first morning came early - like 4:30AM early. The kids were up and at 'em. They crawled into our bed and we all tried to doze off, but it just wasn't going to happen. Each day got a little better, but we were up and going by 6:30 or 7AM each morning. Judd and I took turns in the morning going for walks on the bay. Our vacation was spent exploring the different parts of the island. We found a great kid's beach that we spent time in a couple of days. We rented kayaks and hiked to the secret falls. We stopped and tried different restaurants. We ate lots of shave ice and Mac Nut ice cream. We spent time jumping off of the Hanalei Pier. We played on many different beaches. From our house, we could walk about 100 yards down the beach to where a river came into the ocean. This was a wonderful spot for Charlotte and Max to play. 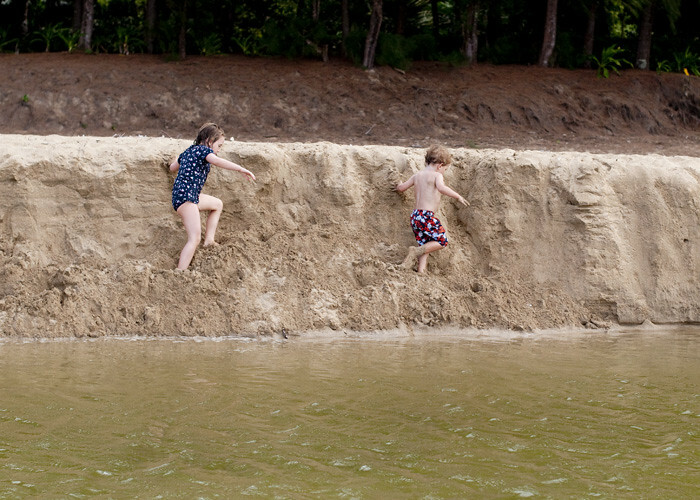 The water was a lot calmer, but Judd and I could watch the kids while sitting on the island between the river and the ocean and put our toes in the ocean waves. 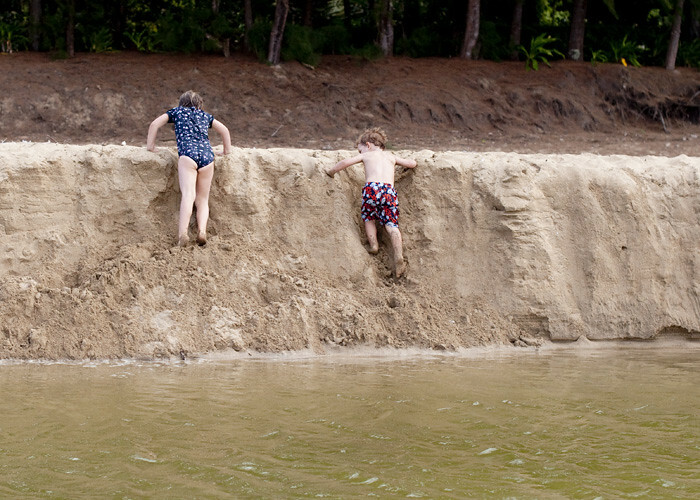 The kids loved jumping off of the sand cliff that the river made. We loved how tired they were afterwards. We spent a few afternoons here. It was seriously beautiful. That mountain behind Max in the last picture would have 3-4 waterfalls visible depending on the rainfall for the day. We would leave our house and all look up there to see how many waterfalls we could see. I actually forgot about these pictures. I didn't have the big camera with me much. 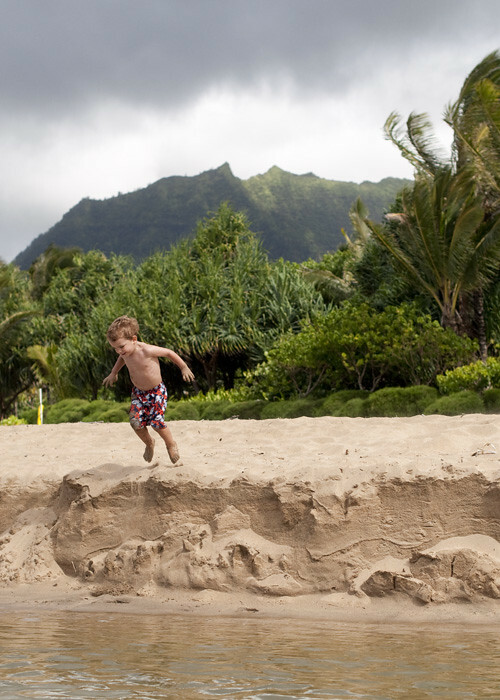 It is just too hard to take when you have small children and LOTS of sand everywhere. I happened to throw it in the car on the morning we went to a little beach, Anini Beach. We were the only ones there. It was a beautiful morning and very peaceful. We searched for tiny seashells. After that, we tried to find the perfect rocks for skipping. (Judd won) We took some pictures. Then, Max fell asleep in my lap, Judd took a nap under a tree, and Charlotte built a sand castle. It was silent for almost 20 minutes. It was a moment that I can still feel as I type this - pure contentment. 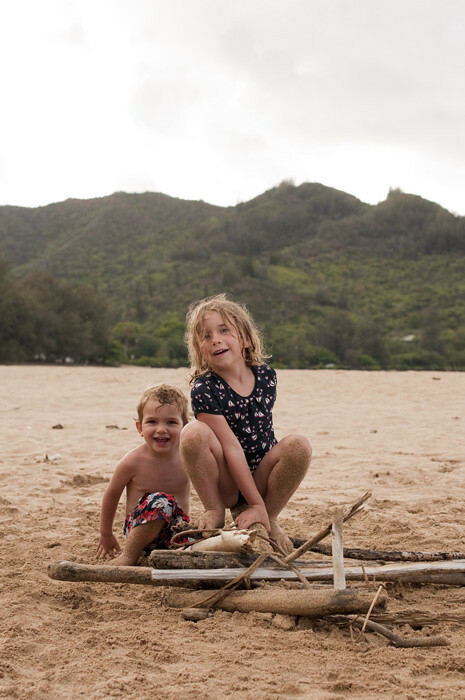 Our last night on Hanalei Bay, we gathered a bunch of driftwood, spend $30 at the store for smores supplies (groceries are SUPER expensive), and had a bonfire. It sounded good in theory, but it started to rain and then Max peed in his bathing suit. So, about 10 minutes in, we had a very smokey bonfire and a naked boy. 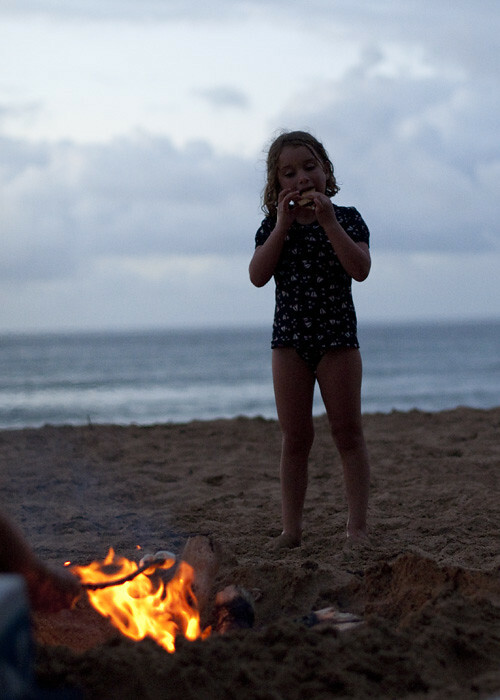 Charlotte didn't care, she had a smore in her hand. 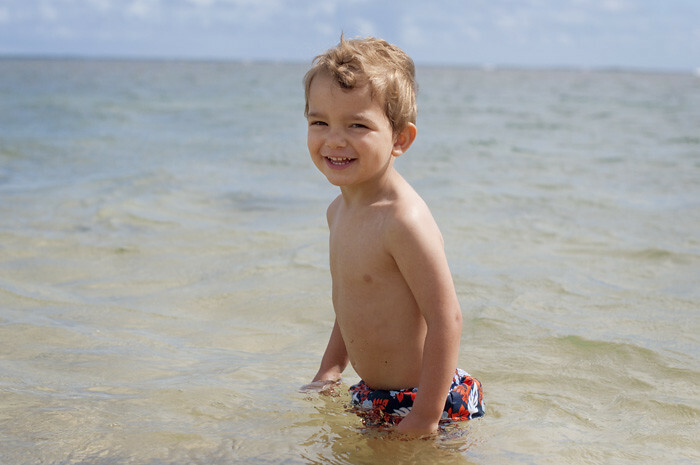 After our 7 nights on Hanalei Bay, we drove South and stayed on the South Shore for 3 nights. We had a very nice condo which had a wonderful ocean view. We were a lot closer to "civilization" down there. It was a very nice 3 nights, but Judd and I both agree that our hearts are on the North Shore. On our last day we were able to play on the beach and use the hospitality suite at the condo complex to shower before we headed to the airport. We boarded the plane around 8:45PM. The kids were AWESOME the whole way home. They slept on the red-eye to LA. Then, Max slept most of the way from LA to Atlanta while Charlotte watched TV on the iPad. It was a family vacation that Judd and I certainly won't forget. I know the kids probably won't remember much of it, other than the parts from the stories we tell them, but I hope they'll remember the fun. That and the fact that they have two parents that want to show them so many amazing places - I hope that this is just the start of lots of summers of adventures. If you want to see more of our adventure, my Instagram feed is full of pictures of our trip. She woke up at 6:30, jumped out of bed and put on her outfit. She has been waiting a few weeks to wear the outfit that she and Grammie picked out together. She quickly sat down and put on the new shoes that she has been waiting to wear. Twinkle Toe shoes that light up with each step. She had a smile that was contagious. She just couldn't wait to get there. After some breakfast and teeth brushing, we coaxed Max into his stroller and put Charlotte's back pack on. Finally, it was time to walk to school. Judd, Max, and I began the half mile walk to the school. About half way there, I looked back and Charlotte was adjusting her shoe. Then she started to walk funny. I asked her what was wrong and she said, "Uh, nothing, nothing really!" I asked if she was getting a blister and she said, "Maybe." So, we said that we would get a Band-Aid when we got to school. As we got closer to the school we were met with so many of our fellow neighbors walking to school. The side walk was packed! It was a really cool thing. We settled her into her classroom with her teacher, Mrs. Williams. I found the Band-Aid jar and placed one on her blister. We gave her a big hug and kiss. Then, we said good-bye and left her sitting on the rug next to the other kids. I couldn't wait to get to her this afternoon. Max and I made the walk back to pick her up. We waited for her, and then I saw her come out of the door. As soon as she saw me she burst into tears. My heart broke into a thousand pieces. Then she said, "I can't walk home, my Band-Aid fell off and my blister hurts! booo hoooo hoooo!" I told her that I brought some flip flops she could change into. She stopped crying and gave me a big smile. Turns out she had a great day, she just didn't want to walk home with a blister! Whew!! I have been more emotional about this transition than I thought I would be. 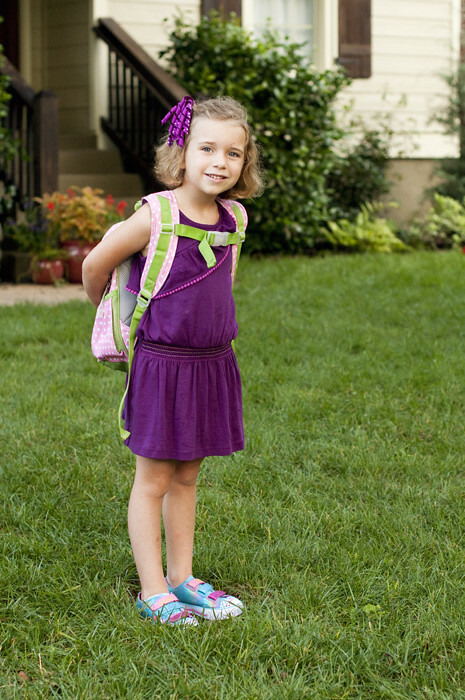 I know that she is ready for school, and I'm very happy that she is starting school - and at such a great school. However, I'm mourning the loss of my pre-schooler. The one that was home at lunch time. Now we're in the big time. And this is it, this is how it is until she leaves us for college. She's going to have a great year. I can feel it. I'm so excited about all of the things she'll learn and see. Kindergarten here we come!